The dynamic equilibrium model itself is just a prediction that in the absence of non-equilibrium shocks the slope is constant (as you can see with the parallel lines). 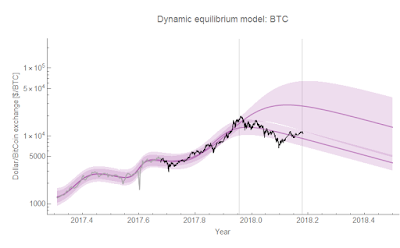 This constant slope has remained a good description of the bitcoin exchange rate since the late 2017 shock. 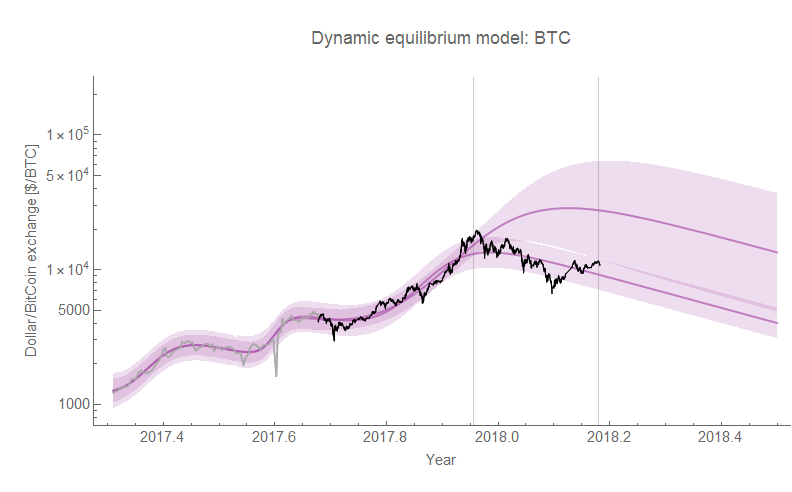 The bitcoin data, like some other economic data analyzed with the dynamic equilibrium model (unemployment), appears to have what in physics is called a "step response": "ringing" that occurs when a sharp shock hits the system. The fundamental reason for this "ringing" is that the system doesn't have sufficient "bandwidth" to support the infinite number of frequencies required to describe a sharp shock (in an economic system, both units of time as well as the number of economic agents determine this ). As of yet, I don't know if there is a solution to this problem (and there may not be as estimating parameters of exponentials is always difficult). Note that the March forecast was predictive of the data for the next month (at the top of the post). 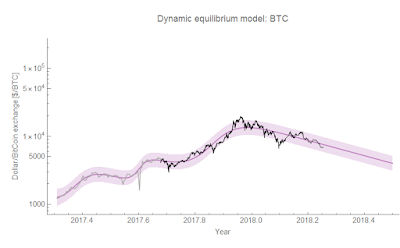 As long as we're not in the middle of a non-equilibrium shock, the model is a good description of the data. One possible reason for the disappearance of the step response in unemployment data is a combination of an increased number of people in the labor market along with the flexibility in time periods people can be employed — in the past, you might have had to start on a Monday or even the 1st of the month because of firms' payroll schedules. Workers wouldn't e.g. work 3 days, then be unemployed for 1 day, and then work again for 10 days (or if they did, they didn't consider themselves "unemployed" during that 1 day). The economic way of thinking? Yes, I've read Duncan Foley. Have you?